MOSUL, Iraq (Mar 7, 2006) � The 172nd Brigade Support Battalion conducted a re-supply convoy for the 4th Battalion, 14th Cavalry Regiment at Combat Outpost Rawah, on Mar. 7. The 172nd drove 17 hours through the Iraqi desert starting at Forward Operating Base Marez and ending at COP Rawah. 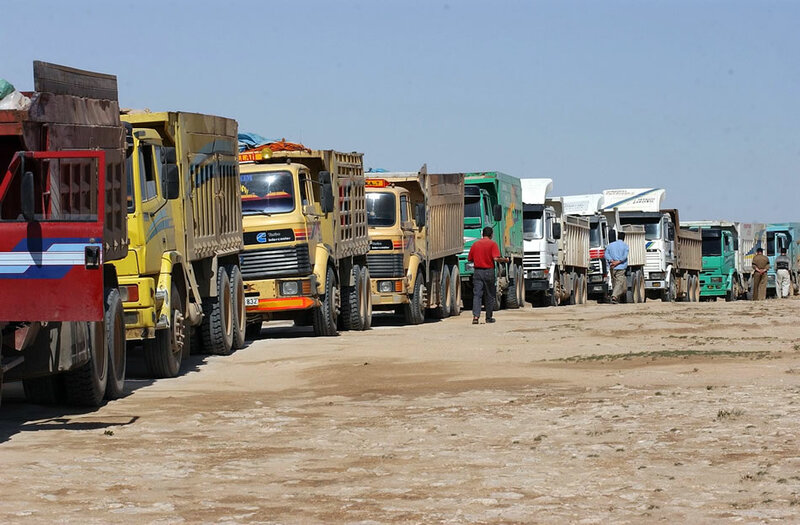 The convoy consisted of security vehicles and approximately 20 Iraqi and Turkish dump trucks, which were delivering gravel to COP Rawah. The gravel was for construction projects on the COP, to include two new Stryker maintenance bays. The 172nd convoys go to Rawah often through out the month. Their mission is based on logistical needs of the 14th Cav. The 172nd is responsible for supplying their own brigade, which includes all the battalions watching over Mosul and out-lying villages, and the Soldiers at Rawah. The transportation route to Rawah is several hundred miles, so the 172nd waits until they have a substantial convoy to make the trip. According to Miller, the Soldiers of the 172nd BSB were a little eager to begin this trip, because it was a sign of success and excitement.